A loan of $225 helped to purchase more goods for her business. 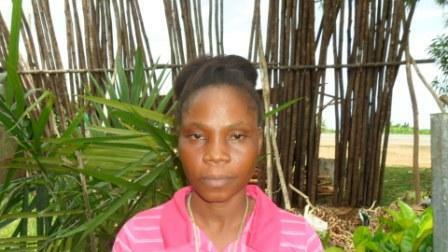 Marie is 33 years old and lives and works in Buchanan, the capital City of Grand Bassa County, located by the sea. It is well known for its beaches and delicious fish. Many logging companies are also based in the city. Residents of the city love eating fufu, cassava-based dough typically eaten with soup or sauce. Most people in the city are Bassa speakers, one of the indigenous languages of Liberia. Marie lives there with her husband and two children, ages 11 and 1; only one is in school. Marie stopped her education at 12th. She has been selling charcoal for the past four years in the local market, and she is requesting a loan to purchase more goods for her business. She likes her business because it helps to support her home. She hopes to one day own a house. She wants to thank the Kiva lenders in advance for their help. This loan is administered by BRAC Liberia. BRAC, the world’s largest NGO, takes a multi-dimensional approach to attacking poverty through offering a comprehensive range of programs in the realms of microfinance, capacity building, livelihood development, health, education, and social justice. BRAC Liberia is the largest microfinance institution in Liberia, a post-conflict country characterized by its underdeveloped microfinance industry and limited access to financial services. The organization offers loan programs in microfinance, agriculture, livestock, health and more, and has reached more than 582,000 Liberians to date. BRAC Liberia is also supporting youth entrepreneurs by investing in their career development through ongoing training and capacity building. Kiva lenders’ funds will help the organization expand its microfinance services in both rural and urban areas, with a focus on reaching the poorest people outside the capital city, where access to microfinance is particularly limited.